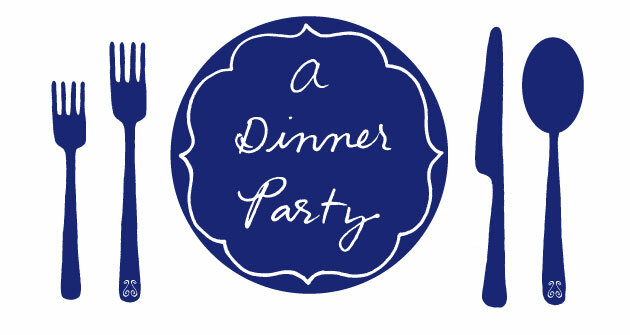 dinner party: what's for dinner, tim mazurek? 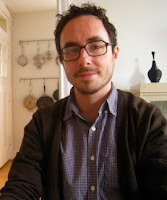 Today we have a great Q&A with Tim Mazurek, the man behind one of my favorite food blogs, Lottie + Doof. Named for his grandmother Lottie, Tim's site features exquisite food photography and a well-curated selection of recipes, many of which emphasize seasonal ingredients. (I can always count on him for a good cocktail or cookie recipe.) Here, he shares his love of salty, carby desserts, favorite dinner party soundtracks, and the way he plans menus. Thanks, Tim! Tim Mazurek, food blogger/freelance writer/photographer, Chicago! This past weekend we had friends over for my birthday. We ordered Indian food from our favorite restaurant and then made apple fritters for dessert. The dessert was a group effort, which made it fun. I don't know, I tend to remember the people and conversations more than the food. But I made an onion pizza and a blood orange tart that were both delicious. I found it satisfying that both parts of the meal were the same shape. Also, they are both easy to prepare ahead and make quickly when guests are over. We usually have a house cocktail that we invent for the evening and then wine with dinner. I like the fun of cocktails but there needs to be wine with the meal. I don't think about beer very often, but it is good too. We play all sorts of stuff with dinner: David Bowie, Aretha Franklin, Joanna Newsom, Bruce Springsteen, Desmond Dekker, She & Him, Dolly Parton, M.I.A.. I usually throw together an iTunes mix before guests arrive. 6. Some friends are coming over for a last-minute dinner. What do you make? Pasta and a salad! Easy. 7. Do you usually cook everything yourself, or do you have help? I am kind of a control freak, I like to make everything myself. I also believe in carefully planned menus and on the rare occasions when I ask for help, I usually supply a recipe. Luckily my friends understand this about me and are not offended when I tell them what to cook. Everything is made from scratch. Sometimes I'll buy bread at the bakery down the street, but I'd prefer to make it myself. Consequently, I take on more than I should and am often wondering to myself why I didn't just buy the bread at the bakery. 9. What do you like to serve for dessert? I spend a lot more time thinking about the dessert than the rest of the meal. I often start with what I want to make for dessert and work backwards. Often some sort of baked fruit thing. I like making my own ice cream, but I don't like to serve a dessert without carbs so I usually make a pie, crisp or cookies to accompany the ice cream. Never chocolate though, I don't care about chocolate. Fruit, butter, salt. I like some salt with my sweet. My friends! Honestly, there is nobody I would rather have over than my best friends. We are spread out around the country and we don't get to eat together nearly enough. Gee, we make trips to Chicago because we have two sons in school there (one at Northwestern!). I will have to jump on over and check out Tim's blog - he sounds like a very interesting guy. The Italian Dish: Tim's blog definitely makes me want to visit Chicago, I've never been! Daniel: Yes, good taste in music and food. You need to visit Chicago, Lisa. It is a good eating town. Thanks again for the good questions and for such an awesome site! Thanks so much to you, Tim! Chicago's definitely on my list. Summer or fall, though? Lisa, I think Chicago is amazing in October. Cool and sunny. Perfect for walking and exploring. Just avoid winter. Let me know if you ever plan a trip!